Consider this play (which isn't standard joseki). After the close pincer , is played in cases when Black is strong locally - it's not a normal joseki. 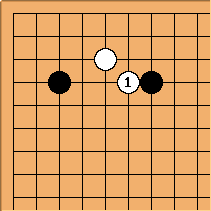 Black next at a or b: if Black at b, White in these circumstances will be happy to play at a. 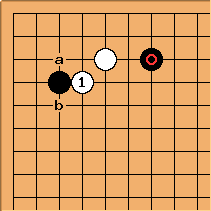 This is from recent days (Kato Masao-Cho U (B) 2003-05-26) in game 2 of the Honinbo match. Black's formation is a Kobayashi variant, considering the position of . Playing is therefore not the most obvious idea, and is severe. 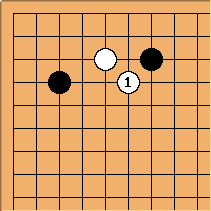 Probably White reasoned this way: in the actual Kobayashi formation Black can react to a later invasion by White at a by invading at the 3-3 point in the right corner (as we are looking at it). In this case Black is a little heavier. Therefore White can spend time up to building up in the centre. 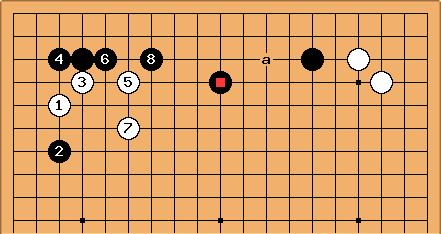 These other variations on the theme are in the same state: they are not joseki in their own right, and can't be called good shape. But they are sometimes used for particular reasons.